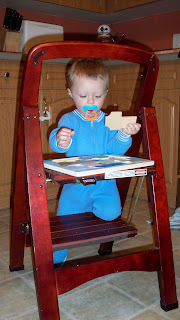 Our little guy is now just over 18 mos old and wants to constantly know/see/touch what is going on around him. Every morning when he gets up, I fix him eggs for breakfast, which he loves. However, he also wants me to hold him while I'm cooking so he can see the eggs, which is difficult at best. 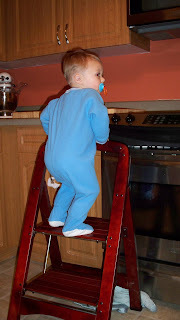 Last week it occurred to me to pull the seldom used step ladder out of our closet and try it in the kitchen with him. Voila! Sold - I can place it such that he isn't close enough to touch the stove and get burned, but close enough that he can see "the action" and not pull at my legs the whole time to pick him up. It also doubles as a work space for him with his puzzle, which he's totally in love with, so that he can work on it while I'm working in the kitchen. Works for me! Check out other great WFMW ideas at Rocks in My Dryer!